LONDON, United Kingdom — Join our special guest speakers Steven Novick; Founder & CEO of Farmstand, Oliver Dickinson; Founder of WOW and Ian McCaig; Co-Founder & CMO of Fiit, for the latest instalment of the acclaimed Welltodo Founder Series – on Tuesday, 25th September, in London. Exploring the various facets of launching and scaling a business in the multi-trillion dollar wellness sector in the UK and internationally; industry expert and Founder of Welltodo, Lauren Armes, will host a panel discussion touching on a range of topics including trends and drivers, growth strategies, cultivating a success mindset, and how Novick, Dickinson and McCaig see the $3.72 trillion industry developing. Taking place in London on Tuesday 25th September, this thought-provoking event for innovative brands, startups, influencers and investors in the wellness industry, will be presented in partnership with international law firm Bird & Bird LLP, the leading provider of cloud-based business management software for the wellness industry MINDBODY, and boutique investment house Financo. With invaluable insights into how to build a profitable and innovative business, the panelists will reveal how they got started, what it took to build their brands, how they have scaled their respective markets and what opportunities lie within one of the world’s fastest-growing industries. We’ll be joined by Founder of Farmstand, Steven Novick. Having founded the sustainable food company in 2016 after surviving cancer and summiting Mount Everest, Novick set himself a goal to build a business that made healthy, sustainable food accessible to everyone, not just the wealthy. Two years on and Farmstand can be found in 20 locations across London including its Covent Garden restaurant, corporate cafes and online. Profiled in over 20 publications including Vogue, The Guardian, The Telegraph, Evening Standard and Elle, Farmstand has won numerous food and sustainability awards, including being named a Top 20 sustainable food service business in 2017 by the Sustainable Restaurant. The forward-thinking startup recently raised $3 million to open more physical locations in a bid to spread its message further. Joining Novick, our second panelist social entrepreneur Oliver Dickinson, is the Founder of healthy drinks brand WOW. In 2015 WOW became the first company to gain EU wide FSA approval to make chia seed based drinks. Dickinson, who launched the brand simultaneously into the UK, Germany and Austria, with France and Scandinavia following less than 12 months later, has since diversified WOW’s portfolio of products to a total of 4 ranges (with more to come) which are now stocked in over 6,000 stores in six countries across Europe. Completing our inspiring lineup, Ian McCaig one of the co-founders of Fiit is a proven entrepreneur with a background in strategic innovation at Google. Having launched the venture-backed FitTech startup earlier this year, his mission is to make fitness addictive and effortless for the majority of people disillusioned with the gym and other offerings in the market. Following the 1-hour deep dive discussion with Novick, Dickinson and McCaig, guests will have the opportunity to participate in a 20 minute Q&A session, before mingling with other forward-thinking movers and shakers from the wellness industry. 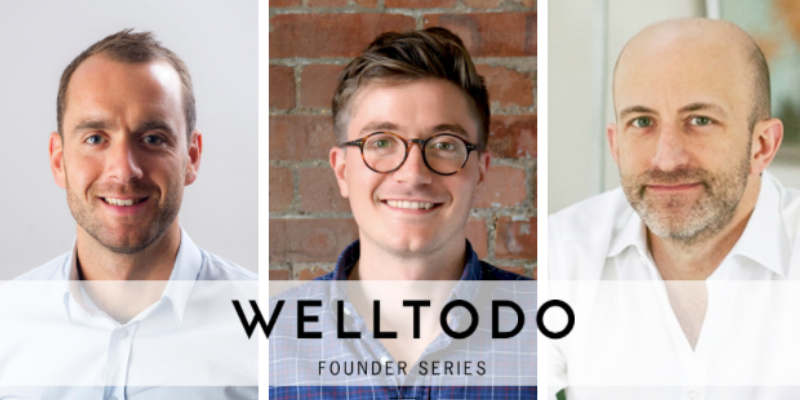 Sparking a dynamic and unique conversation with successful wellness founders, the Welltodo Founder Series has proven to be an invaluable tool for wellness businesses, no matter their stage of the journey. Providing industry insights, business strategies, and practical advice drawn from the challenges faced along the entrepreneurial journey, this latest instalment will be no different. Where Can You Get A Ticket? For your chance to meet and connect with like-minded entrepreneurs, discover what is driving the wellness industry forward and make your ideas grow, grab your ticket here.